The Pentel GraphGear 1000 Mechanical Drafting Pencil features a sleek design and superior quality to provide professionals and enthusiasts an excellent pencil choice. It is equipped with a dual-action retractor that advances the lead and retracts the pencil tip to protect its lead from breaking. It also comes with a built-in lead hardness indicator to easily identify the lead type it uses. 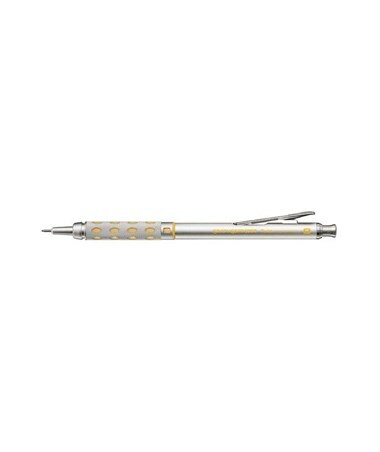 This premium drafting pencil provides maximum comfort while writing with its finely chiseled metallic grip that is inlaid with soft, latex-free pads. Its convenient pocket clip is also used for releasing the heavy spring mechanism to retract the four-millimeter sleeve. 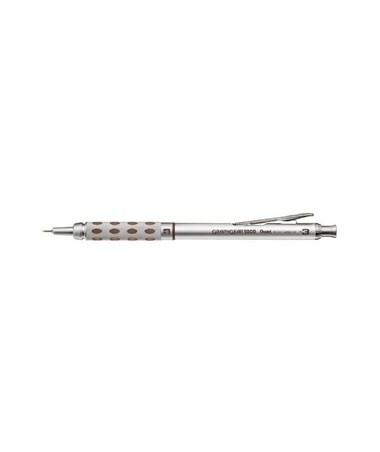 It is pre-loaded with a Super Hi-Polymer HB refillable lead and includes a replaceable eraser. The Pentel GraphGear 1000 Mechanical Drafting Pencil offers four different lead sizes to accommodate most drawing, writing, and drafting needs. Available tip sizes are 0.3-millimeter, 0.5-millimeter, 0.7-millimeter, and 0.9-millimeter, each enclosed in a distinctly colored barrel for easy recognition. 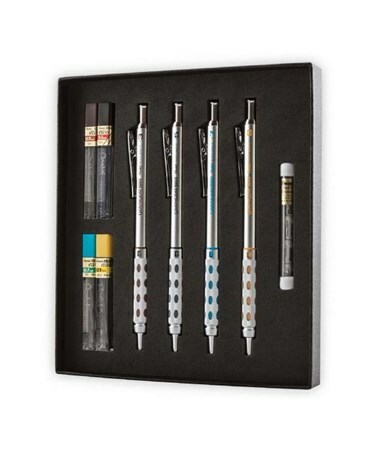 It is also sold in a box set or in a 9 ¼"W x 11 ½"H x 6 ½"L display with assorted tip sizes. 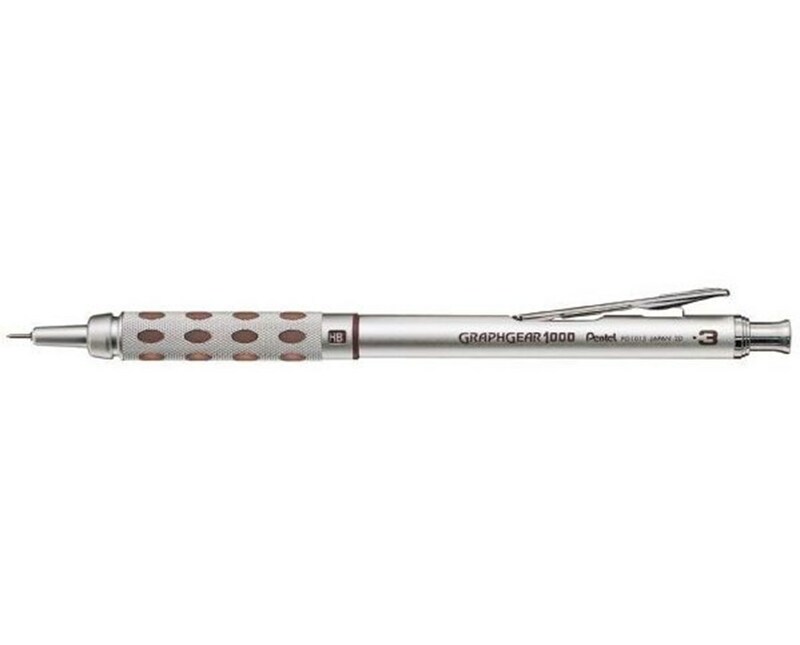 The Pentel GraphGear 1000 Mechanical Drafting Pencil comes in four different lead sizes. Please select your preference from the menu above. This package includes: 4 GraphGear 1000 drafting pencils (0.3mm, 0.5mm, 0.7mm, and 0.9mm), 4 Super Hi-Polymer HB lead refill tubes (0.3mm, 0.5mm, 0.7mm, and 0.9mm), and 4 eraser refills. This package includes: 12 GraphGear 1000 drafting pencils (0.3mm, 0.5mm, 0.7mm, and 0.9mm), 48 Super Hi-Polymer HB lead refill tubes (0.3mm, 0.5mm, 0.7mm, and 0.9mm), and display rack.